As storms raged across the Southeast on Sunday, local TV stations faced a dilemma: They needed to keep the public abreast of the latest weather developments, but knew that meant breaking into Masters TV coverage during one of the biggest days in recent golf history. But not all viewers took kindly to the interruption. Ella Dorsey, an Atlanta meteorologist who works for WGCL CBS 46, said she received death threats after cutting into coverage. She responded on Twitter. Sunday afternoon’s weather had looked threatening for days in advance, which meant CBS stations had time to prepare for the scheduling issue. 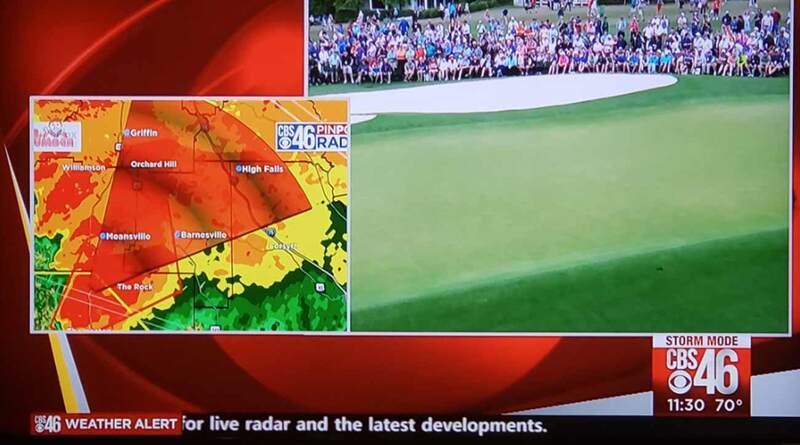 As a result, they were able to “double box” coverage, putting the weather updates on screen while keeping Tiger Woods’ championship charge visible, too. The Weather Channel spoke to several local experts who said they expected the backlash, but were shocked at the level of vitriol. “The venom around this was insane, even by social media standards,” station news director Steve Doerr said. Dr. Laura Myers, director of the Center for Advanced Public Safety at the University of Alabama, was watching the Masters herself and expected people would be upset — but knew the benefits of a cut-in far outweighed the downside. Masters viewers were upset about the split-screen interruptions warning of tornadoes in the area. “The feedback that we got — the backlash that we got — the hatred that we got from that — from that 10 minutes of being on air to keep people safe was unreal. It was disgusting,” Dorsey said on air later that night, lashing out at those who had criticized the coverage. Fifty-one tornadoes raged across 10 states on Sunday. The storms were responsible for at least nine deaths, according to the National Weather Service.